In this talk, “Zikrullah Khadem, The Itinerant Hand of the Cause of God,” Jena Khadem Khodadad relates her remembrances of the life of her father, Zikrullah Khadem, appointed by Shoghi Effendi in 1952 as Hand of the Cause of God. 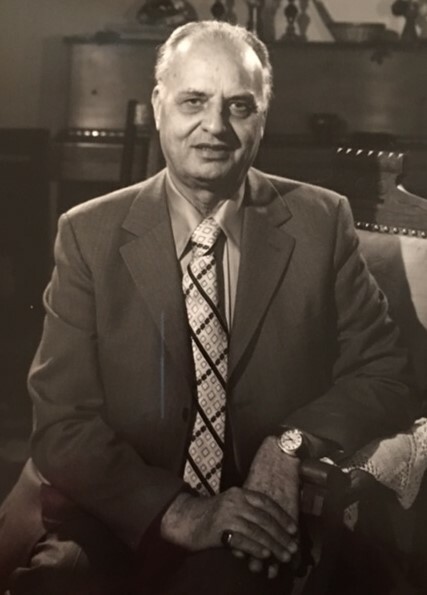 Zikrullah Khadem was born in 1904 in Tehran, Iran, in the Bahá’í enclave known as Hayat-i-Bágh. He was born to a family impassioned with the love of the Faith of Bahá’u’lláh and was nurtured by an illustrious father, Mirza Nasr’ulláh, a devoted mother, Rázziyih Khanum and a courageous grandmother, Bibi Ján. Mirza Nasr’ulláh served as a personal attendant and companion to ‘Abdu’l-Bahá for four years including the period of the Master’s sojourn in the Cave of Elijah and was recipient of tablets from Him. Bibi Ján was a lioness; together, with one other Bahá’í lady, their mission was, time and again, to retrieve the remains of the martyrs for proper burial, by throwing themselves on those blessed bodies, lamenting: “This is my brother, my true brother.” Zikrullah was raised in such a legendary home–a refuge for a constant flow of persecuted and travelling Bahá’ís, a home which received the likes of poets Nayyir, Siná, and Na’im, a home wherein newly arrived messages and tablets from ‘Abdu’l-Bahá were perused and studied in secrecy by the light of a single candle. This talk will recount that at the age of 21, Zikrullah sent a message pledging his love and devotion to the newly appointed Guardian of the Bahá’í Faith, Shoghi Effendi, and attained his presence in 1925, an experience that ignited in him a fire which could not be quenched– with an ever increasing ardor until the end of his life and now beyond. After his appointment as Hand of the Cause, Zikrullah Khadem’s extensive services in Iran became international in scope. Shoghi Effendi conferred upon him the title, “Itinerant Hand of the Cause of God”; under the direction of Shoghi Effendi, Mr. Khadem travelled extensively in Iran, Europe, Africa, North, Central and South Americas, Asia, and the Caribbean. The name, Zikrullah, which means ‘remembrance of God’ characterized him. Until his last breath, this daughter was a witness to the copious flow from his lips of holy verses which throughout his life he had committed to memory. Watch Increase My Astonishment in Thee! (an interview with Jena Khadem Khodadad, exploring Mr Khadem’s passion for the Cause of God.) Click to read/download a transcript of the interview. Listen to Jena’s interview on SoundCloud. In Parts 3 and 4 of this interview, Jena talks about the inspiration for her book The Dynamics of Growth and introduces a few of the scientific truths which can illuminate our understanding of the stages of growth of the Bahá’í Faith.